Topic: Empire vs Ogres, 1000 pts. So a while ago I played another game against our resident ogre player, after being soundly beaten in a 500 point game some days before. I finally got around to writing a battle report for it, hope you guys enjoy ! Dietrich gripped the reins of his steed a little tighter as the cold wind picked up once more, biting straigth through the woolen tunic he wore underneath his chest plate. He gritted his teeth to try and keep them from chattering- after all, what reason to complain did he have, with so many common soldiers marching on foot beside him? At least he was seated astride his horse, his feet well above the cold mud and a thick cloak draped around his shoulders. The predicament of the Wolfsbach fourth Kompanie, however, was nothing like the misery they left behind them. The soldiers of Wolfsbach had traveled for Russbach intent on resting and resupplying, after spending well over a week in the field. Their search for a fugitive band of ogres terrorizing the west of Stirland had so far been unsuccessful, and provisions were running low. When they arrived at the hamlet, columns of thick smoke betrayed that their prey had reached Russbach first, and left naught but destruction in their wake. The men had seen ravaged hamlets before, and while the sight of bodies littering the streets was hard to stomach for any man, it had been a sight they had grown accustomed to. Sigmar knew they themselves had wrecked a town or two on burgomeister von Kasten's orders, usually ones just across the Aver whenever the stewards of Averland refused to uphold their end of a contract with von Kasten. But this was different. This time, there were no bodies- just the charred ruins of houses and splatters of blood in the fresh snow. Knowing that ogres were maneaters, the troops could imagine the fate of Russbach all too easily. A dark mood hung over the column of the Wolfsbach soldiers, the prospect at facing the butchers of Russbach robbing their hearts of courage. So deep were they in thought that that they did not perceive the threat until it was far too late. The first warning the Empire's soldiers got was a loud bellowing, followed by a cacophony of violence exploding in the centre of their marching column. The ogres had found them. Ogres turn 1- outriders gone, cannon gone, off to a good start! Dietrich had barely managed to remain in the saddle, a feat that in all honesty was more properly attributed to the craftsmanship of his stirrups and reins rather than any sort of skill. His fellow outrides hadn't been as lucky- of a unit of five, he was the only one left alive. 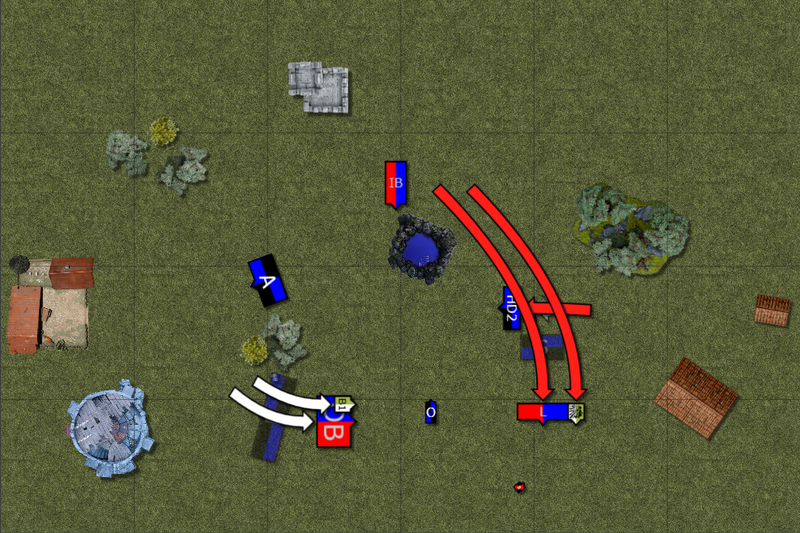 Ahead, the carnage was even greater- the artillery train had been wrecked. Apparently something had detoned the barrels of gunpowder, leaving naught but a soot-filled crater where men of Nuln once stood. No doubt burgomeister von Kaspen would have some explaining to do to whatever lord had granted him use of the artillery! Their attackers- the ogres which they had been sent to hunt- were closing in fast, and it was a testament to the skill of the unit sergeants that they reformed the marching column into a battle-ready line with such haste. The halberdiers and spearmen on Dietrich's left and right surged forward, eager to receive the ogre's charge. On the far right flank two massive beasts ridden by brutish ogres rounded a copse of leafless trees. The flanking manoeuver would have been disastrous to the ill-prepared soldiers, if it hadn't been for Adelmund Freibach, pyromancer attached to the Kompanie. The battle wizard traced patterns in the air with his hands, a mixture of growling and humming escaping his lips as he did. Moments later bars of flame sprang up around the oncoming Mournfangs, singing beasts and riders alike. For the moment, the ogre's cavalry was pinned. Dietrich leveled his repeater handgun at a group of ogres lying in wait behind a pond- brutes carrying what seemed to be cannons in their muscular arms, while a cannon of truly epic proportions was borne by a massive beast. Unfortunately his hands still trembled, his head pounding from the blast which had killed his colleagues. Dietrich squeezed too hard on the trigger, and the shots went wide. End of Empire turn 1. 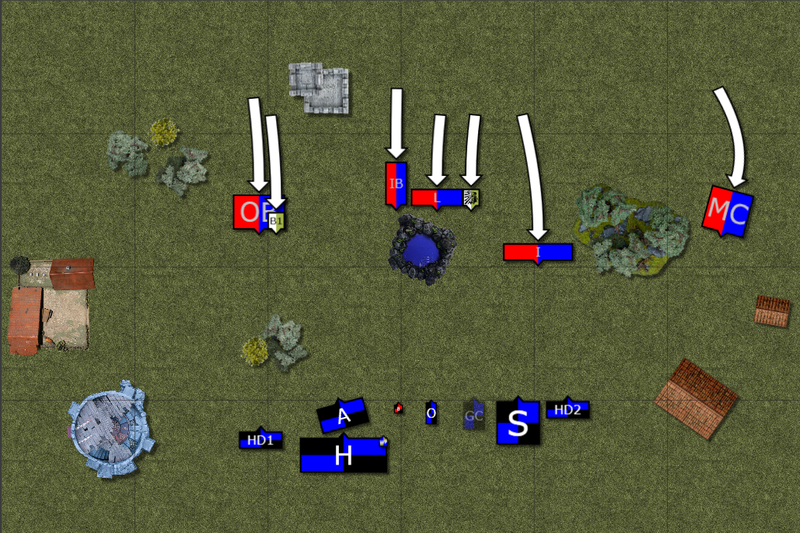 The ogres showed no sign of slowing, and Dietrich quickly reloaded his weapon to prepare for the next threat. Cursing at his poor shot, the outrider resolved not to miss again. On his left, Dietrich could see the men of the Empire advancing under heavy fire, not content to simply wait for the ogres to reach them. 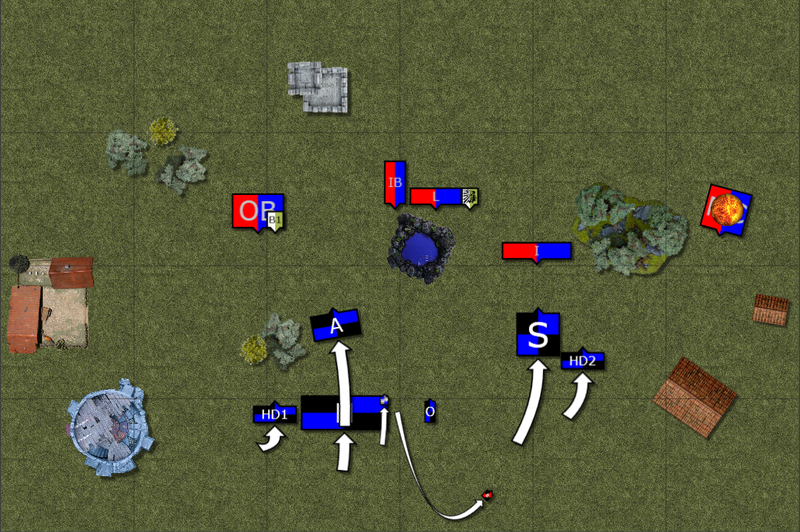 In the heat of battle, however, confusion reigned, and Dietrich could see some of his comrades falling into a deep pit which had opened under their feet. The next moment a loud burp erupted from that pit before it closed again. The ogres were all too happy to happy to exploit their opponents' confusion. Rounding a copse of trees several of the monsters, led by the largest ogre on the field. A small group of halberdiers accompanying the Kompanies' mainstay was simply swatted aside, before the lumbering brutes smashed into the waiting ranks of Wolfsbach's finest halberdiers. Taking a quick glance to his right, Dietrich noted with some satisfaction that the enemy's Mournfangs were reduced to blackened carcasses by Adelmund's magics, while a unit of spearmen held against a group of armoured ogres, supported by its detachment of halbediers. End of Empire turn 2. Unfortunately, the discipline of Imperial soldiery lost out to the savagery of the ogres on all fronts. On the left flank, the Wolfsbach halberdiers were first to fall. Had the detachment assigned to them not been destroyed moments earlier then things might have been different, but as it stood not even the warrior priest accompanying Wolfbach's mainstay could prevent the soldiers from fleeing their opponents. The ogres for their part were quick to catch up to their fleeing quarry, ensuring none of the halberdiers got away. On Dietrich's right, the spearmen scarcely fared better. 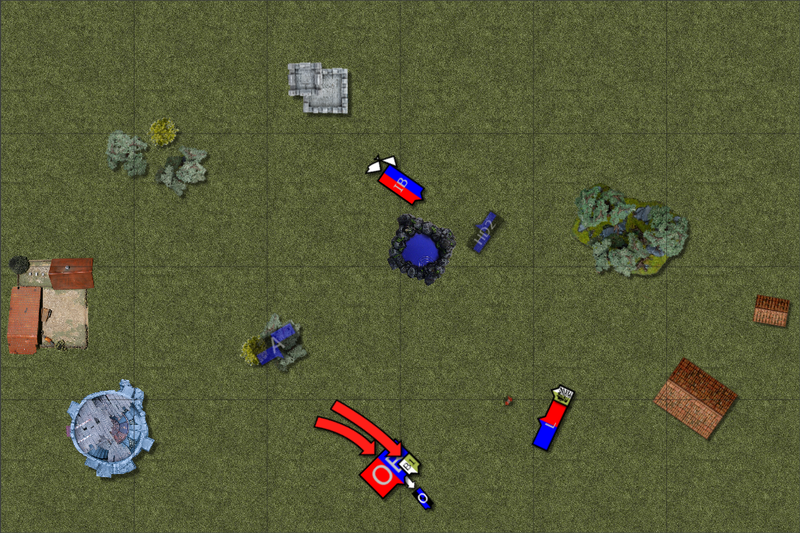 The unit stood its ground admirably, until the enemy's shaman joined the combat. Even against the massive creature and its bodyguard the spearmen would have held, then suddenly the air around them seemed to shift. A low grumbling sound could be heard from that direction, then the spearmen fell to their knees screaming, clutching their heads as if in pain. It was clear the shaman had employed some sort of fell magic which the soldiers had no defense against. Stumbling backwards, the spearmen were overwhelmed, and the shaman and his bodyguard almost casually executed those who could not flee in time. End of Ogres turn 3. Uh oh. Dietrich knew the battle was lost in that moment. Despite the valorous charge of the halberdiers, the Kompanies' main fighting units had been destroyed, while the orges were relatively unharmed. Swallowing his pride, the outrider spurred his horse away from the battle, fleeing before an oncoming tide of ogres. As he rode off the halberdiers, despite their victory over the armoured brutes, were unceremoniously shot to pieces by the ogres' massive cannon. With regret in his eyes Dietrich saw a raging Adelmund shot by a fussilade from the shaman's cannon-wielding bodyguard, while the band of archers who had escaped the doom of their parent unit were now themselves swallowed by the earth. All Dietrich could do was flee back to Wolfsbach, and tell the burgomeister to prepare for an invasion. End of Ogrs turn 4. I can still win this! All in all a fun game, even if the ogres waltzed right over my little Empire guys... Losing my cannon and outriders right at the start of the game cost me big time- if that hadn't happened I could've softened up the ogres a bit before combat, and then... Who knows?